I'm lucky enough to work downtown and have enough time during my long workday to be able to get out and sketch a bit. Here is my quick pencil sketch of the courthouse (detail). 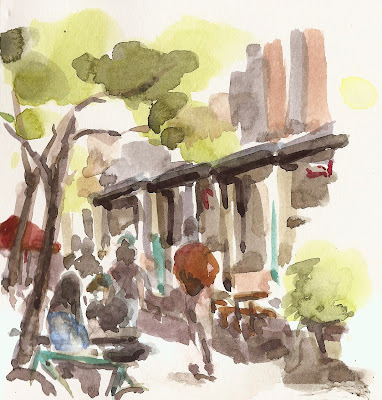 I've been away from my urban sketching for a while so thanks, Andrea, for the unexpected encounter last week...and inviting me back into the group!!! I'm excited to be here! A good group of some regulars and some new sketchers assembled at Riverplace to sketch today. The sun came in and out so on the whole it was a good sketching day with many options for sketching. I did a warm up sketch looking over the boat marina towards the Hawthorne Bridge and then moved further north to get a closer view of the bridge. After sharing I decided to stick around and try to catch some of the people movement along this popular walkway. And I may have been channeling Kalina's quick sketch of the scene too. Our last four classes from Reporting from Portland series will focus on life in the city. 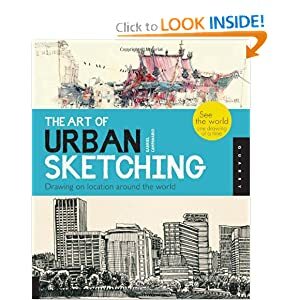 We will tackle the exciting subject of visual reportage, learn to draw ordinary people going around their daily life, master sketching crowds, interactions at markets, and street performers. If you always wanted to have more "life" and characters in your sketches but feel intimidated by drawing human subjects, their reactions, their sudden movements, their proportions–these classes are for you. The exhilarating craft of drawing street performers by harnessing the power of rhythm and music to guide our hand. I am offering a discount for those who want to register for all four classes. Click here to register or contact me with any questions. 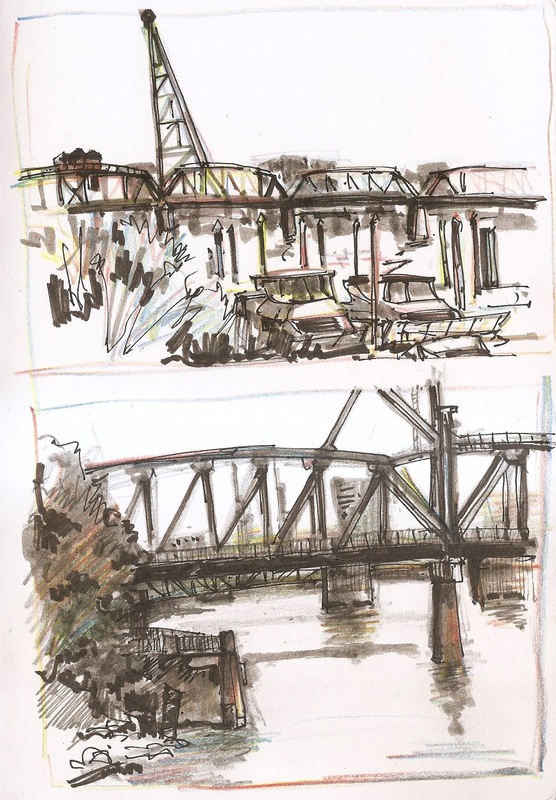 Some highlights from our two past USK 10x10 Reporting from Portland series. On June 3rd we met for a lesson on drawing structures applying the principles of two point perspective and a step-by-step guide on drawing streets. Then a week later we reunited to draw multilayered panoramas learning the tricks for giving depth and complexity to our sketches. Who says you can't have a view and stay warm and dry too? Let's sketch some beautiful watery views! Boats, people, shops, bikes, docks, dogs, geese, trees. 10:00am - Meet outside Upstream Coffee & Eatery, 0315 SW Montgomery St #200, for introductions, coffee, and snacks. 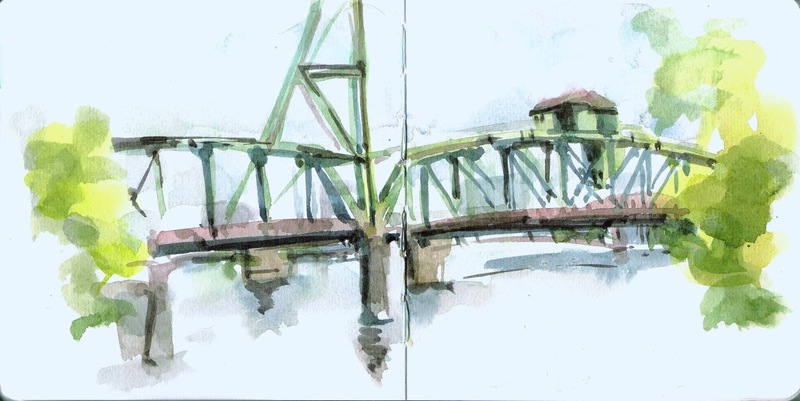 10:30am - Sketch around the waterfront. 12:00noon - OPTIONAL sketchbook sharing and lunch at Upstream Coffee & Eatery again! A quick outing on Saturday with the Portland Meetup watercolor group to the Oregon City Municipal elevator. My first visit to the elevator. Some nice views from inside and out. A path follows the ridge and may hold some additional views for future trips.